This page is a set of short cuts to the various slide shows that may be found in the climbing section. Some are associated with an article on the site but others are just sets of slides. Some photos are “Geo-tagged” - that is there is a Geo icon at the end of the caption that indicates the location where the photo was taken. For slideshows at a single location the link itself is Geo-tagged. The Walker Spur on Les Grandes Jorasses. 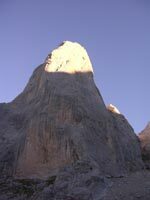 The American Direct on the west face of the Petit Dru. 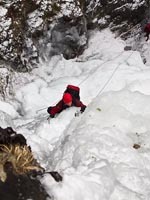 A collection of Lakeland winter routes. 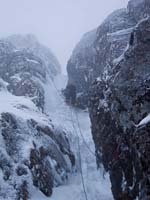 The classic rock routes on Shelterstone in the Cairngorms. An aided ascent of Kilnsey Main Overhang. First and early ascents of Lakes mid-extremes. A trip to Pabbay in the Outer Hebrides. A long weekend on the island of Portland. 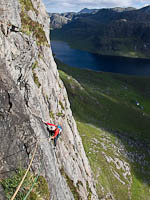 Climbing on Carnmore Crag, Fisherfield.